Microsoft has announced that it will implement artificial intelligence (AI) and deep neural networks to improve real-time language translation for three of the most widely-used languages in the subcontinent – Hindi, Bengali and Tamil. The use of deep neural networks is expected to provide more accurate and natural translations, which would be a welcome relief for anyone who’s tried to translate a foreign language to an Indian language, only to find weird, unnatural and often, blatantly incorrect translations. In a press statement released on the occasion, Sundar Srinivasan, the General Manager-AI and Research at Microsoft India, said that “Microsoft celebrates the diversity of languages in India and wants to make the vast Internet even more accessible. We have supported Indian languages in computing for over two decades, and, more recently, have made significant strides on voice-based access and machine translation across languages”. In case you speak any of the three aforementioned languages and are interested in trying out Microsoft’s AI-powered translations, you can head on over to the Bing Translate website to see Microsoft’s neural network-driven translations in action. The new tech is also being implemented in the company’s Microsoft Translator app that’s available on both Andriod and iOS. The technology will also be used to improve translations on Skype, as well as various Office 365 software, like Word, Excel, PowerPoint and Outlook. I personally tried to translate the first paragraph of this article into Bengali (using Bing Translate), and the results were just as bewildering and incomprehensible as any translation to an Indian language has ever been. 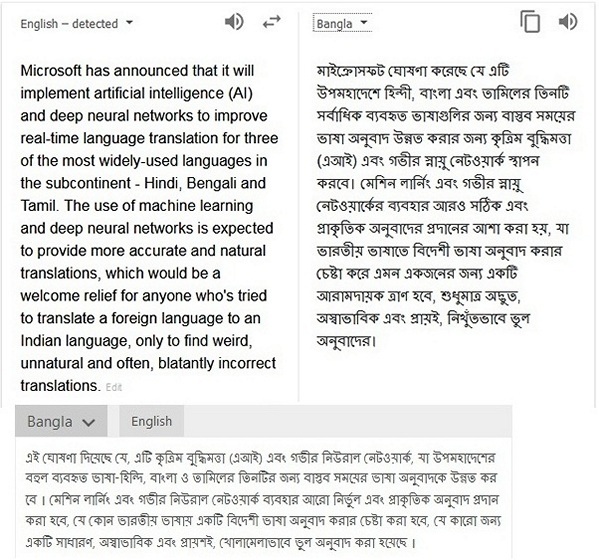 In case you’re wondering how it compares to Google Translate and is familiar with Bengali, take a look at the side-by side comparison below. Note that it is a composite image with the translation from Google on the right and the translation from Bing on the bottom. While there doesn’t seem to be a lot of difference between the two at this stage, the thing to note here is that with deep neural networks, the translations are likely to improve drastically with time, because the technology has the ability to take into account “concepts like gender (feminine, masculine, neutral), politeness level (slang, casual, written, formal), and type of word (verb, noun, adjective)”. As things stand now, though, translations to and from Indian languages will continue to remain unsatisfactory, in spite of the fact that top-6 Indian languages are among the top-20 most widely-used languages in the world. That’s because “There’s not enough material on Internet that we could use to train the system”, according to Krishna Doss Mohan, Senior Program Manager, Microsoft India. Hopefully, with the larger Indian populace starting to use the internet, we’ll have more vernacular content that should help train these deep neural networks to provide better translations going forward.